Budgeting Review = Red Flags!Eliminate The Muda! « Festival of Frugality – How To Eliminate The Muda And Live More Frugally Edition! We’ve been tracking our expenses for nearly 18 months now. With our first full year of data we decided it was time to review where we stood. What we found was reason to celebrate and reason to cry. Our expenses came up 4.9% under our initial annual projection. Yipee! I am so proud of my wife, she did much more than I to get spending under control. In some areas we spent much more than anticipated, in other areas, we’ve just realized we are still blind. We killed the budget in a few categories including Pets, over by 238%. Ouch! Our dog had a couple health issues this year. Apparently eating soda cans is not good for them. Trooper is part of the family though so there’s not much to be done. The root cause however is addressed, I quit drinking soda’s earlier this year so, no more soda cans! This article was featured in the Carnival of Money Stories hosted by Funny about Money. Please check out this carnival for many other great articles about personal finance. Spending on tools and equipment was 78% over budget. But the good news here is that all of this was offset by sales of pieces I have created. Groceries were also over budget for the year. With the exception of December though, there was a marked decline in grocery spending in the last two quarters as a result of efforts to spend more wisely and price comparisons. This year should be much better. The chart above is a summarized version of what we use but we still have an opportunity to improve the detail. For example we lump virtually everything into groceries that is bought at any of the stores we frequent. Cleaning supplies and personal hygiene, I think, need to be separated from food. Now here’s the really bad news – We screwed up! I am also getting ready for tax season. Pulling together all the documents we will need. In doing so I downloaded a copy of our last paystubs. It was at this moment that a big red flag started waving with fireworks in the background. Our total after-tax, after insurance, after-everything else take home pay was over $6,000 more than our total expenses plus investments and savings. Double ouch! Where’s the beef? We need to improve our spreadsheet, and we’ll have to improve our process. My wife is a pencil and paper kind of gal. I want the ability to slice and dice, so we ended up with both handwritten sheets and an excel spreadsheet. She writes it down and I transfer it into a spreadsheet. With a little root cause analysis tonight we found at least a couple flaws that will address some of the difference. She has been collecting the data primarily from receipts. Occasionally there are charges to cards that don’t have a receipt conveniently available to put in the pile. We are both in a habit, mostly, of dumping our receipts on our desk in the kitchen. Upon reflection there are times we (I) fail to do so. I have a separate account for travel. Reimbursements generally cover 100% of costs during travel but occasionally we transfer some cash over. We have not been tracking this. My hobby income and expenses are not always accounted for. I am sure there are other issues we have not yet identified. But identification of this discrepancy will only help us get better control over our finances and help us take the next step towards eliminating unnecessary expenses. 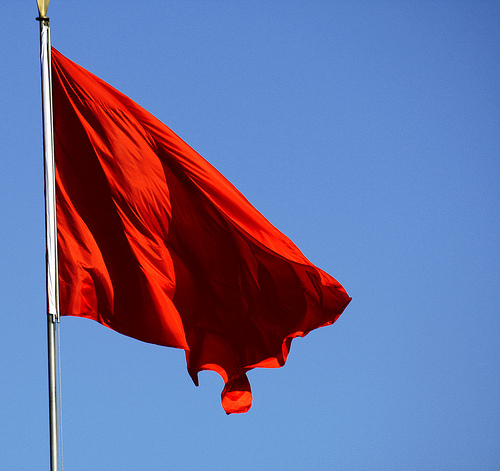 5 comments to Budgeting Review = Red Flags! I need to sit down and do this. It seems like I never have the time to do it though! Mrs. Money, thanks for stopping in! We tried several times over the last 10 years. Mostly we failed. However once we got serious, it was amazing how much difference it has made. Even after we though we’d trimmed the fat everywhere we could we continue to find more opportunities. AND we are still missing 6K! That still hurts. Just think where we would be without what we have done so far. I cannot recommend it enough, even if you don’t get it all correct it still pays for the time and effort. The dog ATE a soda can? Good grief. That outdoes the antics of all the dogs that have lived with me over the past 30 years taken together! Surviving that adventure without going broke must mean you’re doing pretty well with the financial management plan. .-= Funny about Money´s last blog ..How to Move Your Money =-. Over all we are doing very well. It’s been hard work but it is paying off! The only debt we have left is the mortgage but since we got started late building our retirement we are playing catch up now. And yes, soda cans! And I promise we’ve been feeding him. In fact too much, out vet says we need to put him on a diet. There are not many 100+ pound labs out there!